Product code: T845 Categories: Antique, Antique Engagement Rings, Antique Rings. From every angle, this magnificent 18ct yellow gold antique sapphire and diamond ring will take your breath away – from the sparkle from the diamonds, the intensity and beauty of the sapphire in the centre, to the incredible scroll work on the sides, this ring is exceptional in all respects. Beautifully hand made in the late Victorian period of the 1890’s, in the centre sits a magnificent natural sapphire that measures 3.20 carats in weight. Not only does it display a magnificent colour and transparency, but it also has the wonderful feature of not being heat treated. Natural sapphires and rubies among other stones, have been heat treated for centuries to improve the gemstones colour and transparency, and this is a completely standard and stable treatment. However it is quite something else to get a sapphire of this size that displays such a spectacular blue colour that has not had any treatment at all. This is one of the finest antique sapphires around that is just magnificent in all respects. And then set on each side are two large European cut diamonds that have a total weight of 1.90 carats. The proportion of these diamonds accentuates and highlights the size and quality of the sapphire and then to add even more charm and character, there are two small antique cut diamonds set on each side of the sapphire, with a further antique cut diamond at each end. These additional diamonds total 0.06 carats and highlight the quality of craftsmanship that went into making this ring all those years ago. Measuring 8.4mm wide at the centre by 20.2mm across, looking at this ring from the side will take your breath away. The hand carved scroll work on the side is as spectacular as the sapphire and again showcases the incredible detail and craftsmanship that is made all the more amazing that this was all made by hand well over 100 years ago. From every angle that you look at this ring you will see that this ring was made to the highest standard and quality with a superb sapphire to match. This ring would make an incredible antique sapphire and diamond engagement ring. Set with a magnificent natural sapphire that measures 3.20 carats, it has also not been heat treated. 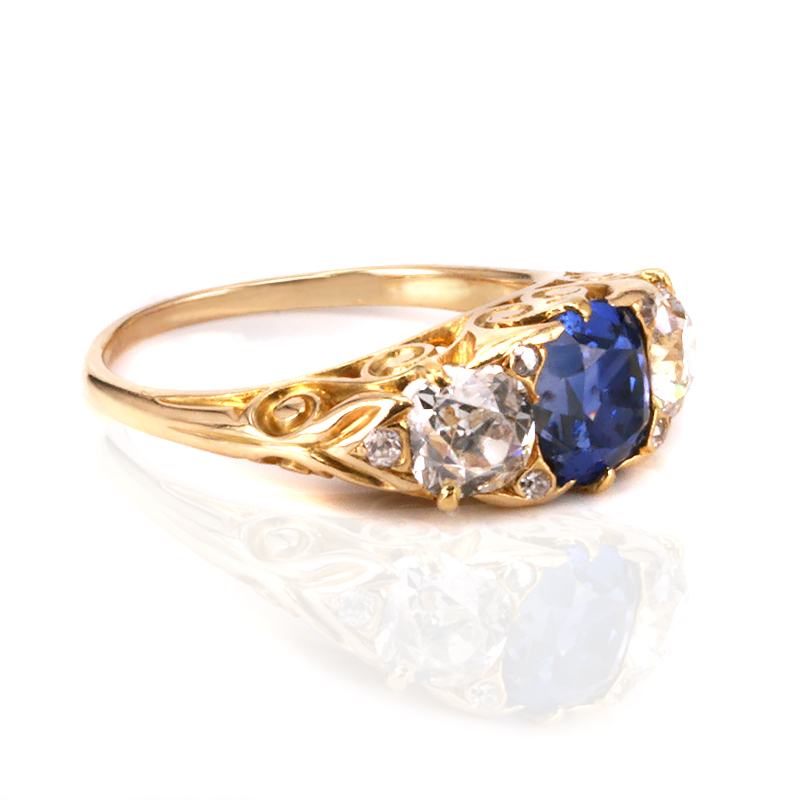 This antique sapphire and diamond ring also has the most incredible scroll work on the sides. Sapphires and rubies have been heat treated for centuries to improve their colour and clarity and this is a worldwide accepted practice. It should be clarified that a sapphire or ruby that has undergone some form of heat treatment is still a natural gemstone from the ground and is not a synthetic/man made stone and the treatment is completely stable. Lately on the market there is a technique of glass filling or lead filling stones which will improve the colour of a natural gemstone, however this treatment is very unstable and the stone may look worse in a few years.